I live in a tiny town and go to a small church that is blessed with several good teachers. On Sunday, one of our elders (a certified genius), was teaching about worldview while our pastor took a much needed vacation. He posed this question to us: In what ways do humans differ from animals? We try to get out of the Clergy-Laity mold at our church, and there is often feedback from the crowd during a church service. Our teachers encourage us to interact with the message and ask questions, give answers, and fellowship over the Word. It's awesome and scary, all at once. A few people offered answers to the question Sunday. We talked about love and empathy, compassion, self-sacrifice. I had words burning in my heart and I stuffed them there, but they've been smoldering all week and it's time for them to come out. We, created in the image of a Beautiful God, have the ability to appreciate beauty. That's what I thought of when I thought of the difference between mankind and the animals. I thought about the way I appreciate the cloud forms, the sun through the window, the perfect symmetry of a flower, the colors in the garden. We all appreciate different forms of beauty, but I think it's hard-wired in us to look for it. So today, I'm sharing some beauty I've been appreciating lately. I can lean hard towards cynical and sarcastic, but God disperses beauty in my life and I want to honor Him by truly seeing it. The camera roll on my phone is full of these. I don't know if this has just been an exceptional season for some amazing clouds, or if maybe my eyes, which tend to focus on the ground and the floor and the laundry and the filth, are shifting upward and looking more. Appreciating beauty in all it's free forms. My family is starting to point them out now, too. It's full of goodness, and I'm no green thumb. God's imagination made plants that bear fruit that bear seeds. We stick them in the ground, water them, and then feed on their goodness and their beauty. My son planted a seed from a store-bought acorn squash this spring, and it's prolific, I tell you. I'm on the hunt for recipes. This Autumn Manifesto from Tonia? Makes me want to slow down and find the gorgeousness of every. single. day. And this one from Kelli. If your kids are done with diapers and your days are busy with activities that teenagers pull a family to, read this and remember. If your days are about diapers and naptime and "heart-to-heart chats over toilet seats", read this and savor the moments. This girl, this beauty with beauty inside, she made my homeschool-mama-day this week when she said that she liked her new physics course. Liked it, people. Enjoyed her book, was interested in the left-brained orderliness and facts and laws, and was motivated to glean all she could from it. You guys, the angels sang. Because it has been a hard transition back to school this year, and I've felt defeated and discouraged and like a failure. And then, she liked it. We've been reading a book together at lunch time (for about a year now) and it's full of humor encased in large words. We love it. It's about a boy and all his mishaps and mischievous doings, all the unintentional trouble a boy finds when he's just being a boy. This week, he was daydreaming in class. 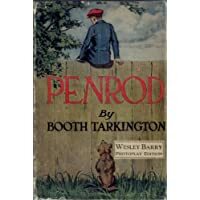 Penrod was flying in his daydream. Lifted out of his classroom, through the window, all around the town, and serenaded by a parade the townsfolk were giving in his honor. He saw the girl of his dreams. He floated above all the adults who constantly reproved him. He was free and he was noticed. Miss Spence - in the flesh - had directed toward the physical body of the absent Penrod an inquiry as to the fractional consequences of dividing seventeen apples, fairly, among three boys, and she was surprised and displeased to receive no answer although to the best of her knowledge and belief, he was looking fixedly at her. She repeated her question crisply, without visible effect; then summoned him by name with increasing asperity. Twice she called him, while all his fellow pupils turned to stare at the gazing boy. She advanced a step from the platform. "Oh my goodness!" he shouted suddenly. "Can't you keep still a MINUTE?" Not everyone will appreciate this book. It's old, the language is not always politically correct in the 21st century, and younger kids will miss most of it. But if your kids are generally well-behaved-with-a-side-of-ornery, and if your school day is a little monotonous at times, you might laugh. Laughter is a beautiful thing. We are blessed to have some young adults around us who truly, genuinely love the Lord. And, they have great talents. Is this the common struggle? The deep down desire of every person made in His image? Misunderstandings take the blame for many a disagreement, and the struggle is that you would know what I really mean, know what my intentions are. But does that solve anything, really? Does knowing your intentions make your actions o.k.? I hear this struggle from my own mouth, masked with adult-sounding words and deep frustrations. I want perspective but it needs to be my own, from behind my own two eyes. I want you to see the world as I do, really. And then, maybe, you'll be o.k. with my short-comings. But you don't understand. And I don't understand, either. Shouldn't we just stop that struggle, quit blaming "misunderstanding" and instead, think no evil, judge no motive? Let me just say that, no, I don't understand, and I'm o.k. with that. I'm fine with not knowing everything about you and all your past experiences that lead you to this day and that decision and those words. It's alright that all the inner-workings of your heart are mysterious to me. In fact, maybe it's good. That deep understanding, that intimacy with your heart? You ought to reserve that place for Jesus. Why do we cling to being understood by people, when there is One Who knows our hearts completely and loves us anyway? God does. You know He was tempted in all the same ways you are, yet without sin. (Heb. 4:15). We stand in awe of Him, but He is never puzzled by us. Everything is bare before Him and even those things we try to hide, the motives we really don't want checked, He's got those figured out. And in spite of all He understands about us, or maybe because of it, He sympathizes and pours out mercy and grace. You are complete in Him. Yep. Your greatest need is not to be understood, but to be in Him. Love matters more than being understood. You can know all mysteries but have no profit if love isn't there (1 Cor. 13:2). Love is the benefit of the doubt and the understanding of the most important things - that we all mess up and and we're all worth fighting for, worth dying for. Really. So I can love you by trying to understand you, yes. But when you don't have my perspective and I don't share yours, when your words run out and all I have is your actions and my clouded vision, I will choose to love without understanding it all. We could spend all our time preparing and never go anywhere. We think there’s something more we need, something else or something better. Really, what we need is more Breath and instead we hold it, prevent it from escaping and the Life stays stopped up inside us. God exhaled Life into us and we gasp for more, but it’s really all there. Everything we need for life and godliness, right down to the adrenaline, He breathed it into the dirt and we stand up to demand more. I skip days on the prescribed running plan and my preparation for this 10k is laughable. I worry about not having enough breath and are there hills and can I really go the distance again, all unprepared as I am? This is where I explain why I pay money to run. Running is cheap exercise and it’s easy and there’s not much coordination or skill involved. Buy some decent shoes and go. But some days the go wants to not and what we all need is motivation. So I send in my check a month before the race, sign the waiver on my excuses, and I commit. When race day comes, I run because the adrenaline surges and I paid to be here and sometimes that is all the motivation I need, and there is breath enough. I question the sanity of it all mid-race, but I put one foot in front of the other and finish. I’m happy with my time and there are cookies at the end, a second-place ribbon, and a task accomplished. You don’t need me to draw the parallel between running and our walk with Jesus. But what you might need to hear, again, is that all-preparation and no-action will never get you anywhere. Even if your preparation is lacking, there comes a time to act. Ready, or not. You can only hold your breath so long and then, just the way He designed it, your body will exhale. We started school in full force yesterday, my 13th year of homeschooling and learning right along side the ones God has entrusted to me. I was not prepared and gasping a little. It made my husband nervous, telling him that I wasn’t sure what I was doing and didn’t really know yet how it would all work out. He’s the one that always says, “We’ll know more when it’s over,” and he’s right. We learn as we go, but we have to GO. Those dreams you never start, they never fail. They bring no heartache or disappointment, but don’t we learn best from the processes we go through, rather than the ones we only daydream about? The letter you don’t write because you’re not ready, the meal you don’t make because it might flop, the mission trip you reject because you don’t think you have anything to offer, and the friendship you don’t offer because you might be rejected…none of those things ever hurt or disappointed you, did they? You have big dreams and you have everyday things that you want to do, need to do, and have Breath enough to do. We’ll all know more when it’s over.